Is animosity towards Jews different from other forms of prejudice and hatred? If so, can this particular brand of hatred have a history of its own? And, what happens to anti-Jewish animus and attitudes when we set out to write such a history? These and other questions lie at the core of David Nirenberg’s engaging, erudite and thought-provoking work, Anti-Judaism: The Western Tradition. Tracing the various images of Jews, Judaism and anti-Judaism from ancient Egypt till the middle of the twentieth century, is, as he himself admits, a daunting task. That said, his goals and methods are clearly defined and the end result is an intellectual tour-de-force. As the author states in the book’s introduction, the aim of the work is ‘to demonstrate how different people put old ideas about Judaism to new kinds of work in thinking about their world; to show how this work engaged the past and transformed it; and to ask how that work reshaped the possibilities for thought in the future’ (p. 5, also see pp. 3 and 413). Throughout this comprehensive study, Nirenberg argues that looking at ‘the Jews’, or more precisely, opinions, thoughts and treatises about Jews and Judaism can teach us much about the nature and course of Western society, culture and history from ancient times till today. 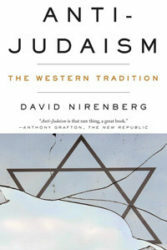 Hence, much like many other works on anti-Judaism – or those that address its more common (and far more loaded) appellation anti-Semitism – ‘the Jews’ in Nirenberg’s work are an object of debate and a prism through which Nirenberg attempts to read, decipher and interpret thousands of years of history (pp. 7, 132, 429). Thus, while ‘the Jews’ are situated at the center of this tome, they are neither the motor nor the agents that drive this particular history. The ramifications of these fundamental assumptions are as critical as they are debatable and herein lies the beauty, challenge and risks of Nirenberg’s ambitious endeavor. Between the artfully written introduction and the probing epilogue, the book’s thirteen substantive chapters are arranged chronologically as the author sets out to examine attitudes towards ‘the Jews’, Judaism and anti-Judaism in ancient Egypt, early Christianity, medieval Spain, Shakespeare’s England, Reformation Europe, the Enlightenment era, modern times and many other epochs. Firmly grounded in the history of ideas, each chapter focuses on key thinkers in a particular period and delves deep into their writings on the subject. Over the course of almost five-hundred pages, readers are privy to an astonishing array of insightful analyses of how key figures as diverse as Paul and Augustine, Shakespeare and Luther, Spinoza and Kant, Hegel and Marx, Wagner and Sombart, Heidegger and Goebbels all wrestled with different interpretations and meanings of Jews and Judaism. Nirenberg’s readings of these and other central thinkers are convincing and the author is clearly at his best as he gracefully guides the reader through these and other texts with analyses that are simultaneously creative and grounded. Moreover, while specialists may feel the need to refer to more detailed studies such as Jeremy Cohen’s seminal work on Augustine, Ruth HaCohen’s ground-breaking study on Jews in the musical realm, and Ronald Schechter’s discussion of attitudes towards Jews in enlightenment and revolutionary France, I can think of few works that cover such an expansive historical and geographic terrain in such a cogent and learned manner. Taken together, these readings form what the author refers to as ‘The Western Tradition of anti-Judaism’. However, while the book follows a chronological path from Ancient Greece to Early Christianity and from Reformation Europe to the dark heart of European Modernity, Nirenberg maintains that unlike other master-works on the history of anti-Semitism – including those penned by the prolific scholar Robert Wistrich – his is not a tale of how an age-old religious rivalry paved the way for the Nazis’ implementation of the Final Solution (p. 3 fn2, also see pp. 8, 9, 11–12, 462). Tellingly, Nirenberg warns readers not to be tempted by easy answers to such questions (p. 2). This methodological distinction is critical for both the author and his readers and remains the work’s most ambitious and important contribution to the field as well as its most intricate point. Can one write a chronologically-oriented study of the anti-Judaism without slipping into familiar renditions of the ostensibly separate, unique and, perhaps, inevitable path of a genocidal anti-Semitism? Can Nirenberg (or any other scholar for that matter) write a study let alone a history of anti-Semitism that grants the past influence without succumbing to a historical narrative that is, willy-nilly, self-fulfilling if not deterministic? When writing about Jews, Judaism and anti-Judaism, where is the narrative tipping point of no return? Acutely aware of these multiple and intersecting tensions as well as their contemporary ramifications, the author goes to great lengths to explicate his nuanced position. Discussing one of the central thinkers of the modern era who was both an object and purveyor of anti-Judaism, Karl Marx, Nirenberg notes that ‘Marx’s own philosophy here depends on and reproduces deep continuities with Christian figures of Judaism…’ (p. 431, also see pp. 438–439). Following up on Marx’s debate with Bruno Bauer on ‘The Jewish Question’, Nirenberg contends that Bauer’s thinking similarly bore the imprint of hundreds of years of Western thought on ‘the Jews’: ‘Bauer’s argument depended, like so many others in this book, on a number of un-self-consciously borrowed Christian concepts, such as the casting of the Jews as figures of anti-universalist particularism. They are egoists who demand emancipation for themselves as Jews, rather than, as Germans, political emancipation for all Germans or, as human beings, the emancipation of all mankind (p. 434).’ Reflecting an enviable degree of intellectual consistency and a simply dizzying display of textual mastery, Nirenberg makes similar observations regarding Burke (p. 382), Kant (pp. 394–395), Hegel (pp. 404, 407–408, 415, 417), Sombart (p. 442) and other thinkers. For Nirenberg, the past is always present but never omnipresent. The different historical questions, methodological dilemmas and contemporary anxieties that this study reveals and raises in texts, authors and readers remain the biggest challenge of Nirenberg’s intellectual oeuvre. How these intersecting tensions will be studied, understood and explained ultimately depends on the students, scholars and readers who will gain immeasurably from David Nirenberg’s engaging and erudite account of the West’s encounter with and attempt to make sense of Jews, Judaism and anti-Judaism.